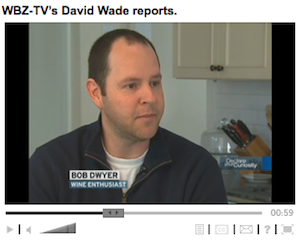 A couple weeks ago David Wade from Boston's CBS affiliate WBZ-TV came over for an update on Massachusetts wine shipping laws. In 2010 courts ruled that direct shipments should take place but little has changed since then. Many wondered - why? I explained in the interview that we needed additional changes to Massachusetts law to enable wineries to ship to us. At a high level we need to define how licensing and shipments should take place. Beyond that there are a few key sticking points. 19F (a) allows for direct shipment for large wineries provided they don't already have distribution in Massachusetts. Both bills strike 19F (a) and replace it with no mention of whether the winery has distribution in the state. 19F (e) says that no household can receive more than 240 liters of wine annually. The problem with the current arrangement isn't the amount of wine allowed - it's that any given winery wouldn't know whether they were the ones who tipped a consumer over the 240 liter cap (about 26 cases). HB 1029 imposes a 24 case annual cap for each winery per consumer. HB1883 strikes the mention of a per-household cap without imposing a per-winery cap. This is by far the most important issue, and it's what has long been limiting small wineries from shipping to Massachusetts. If you consult the FedEx and UPS websites they say they don't ship wine to Massachusetts. Chapter 139 Section 22 requires that each truck that carries wine has a $150 permit. I'm not sure how many trucks FedEx and UPS have, and which of their trucks are currently licensed (I've been trying to contact FedEx for clarity on this issue for weeks - if you know someone at FedEx or UPS who could speak to this issue please have them contact me at wellesleywinepress@gmail.com) but the two bills vary in how they'd change licensing. HB 1029 offers a $5,000 annual fleet license. HB 1883 simply says that any firm doing business as a parcel delivery service can deliver wine without an additional permit. HB 1883 sounds preferable in this respect since FedEx and UPS might balk at the $5,000 figure and decide it's not worth their while to pay the $5k each year. So there you have it. If our laws are amended according to this bill (or either one really - I'd expect the two bills to be merged) direct shipment of wine could finally be a reality in Massachusetts. Note that this would not enable shipments from out of state retailers - this only applies to wineries. As I've said before retailer direct shipment would be much more meaningful to consumers as it opens up competition on price on all wines and especially selection on imported wines. More on that issue in a future post. If you live in Massachusetts and favor winery direct shipment visit the Free the Grapes website and use their sample letter to E-mail state senators and representative to explain why this issue is important and to request their support.